341 pages | 92 B/W Illus. Combinatorial testing of software analyzes interactions among variables using a very small number of tests. This advanced approach has demonstrated success in providing strong, low-cost testing in real-world situations. Introduction to Combinatorial Testing presents a complete self-contained tutorial on advanced combinatorial testing methods for real-world software. 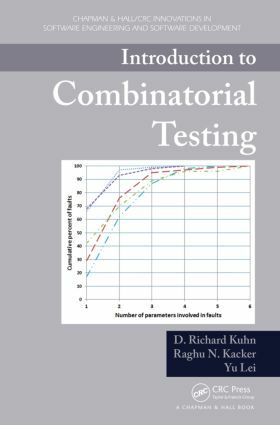 The book introduces key concepts and procedures of combinatorial testing, explains how to use software tools for generating combinatorial tests, and shows how this approach can be integrated with existing practice. Detailed explanations and examples clarify how and why to use various techniques. Sections on cost and practical considerations describe tradeoffs and limitations that may impact resources or funding. While the authors introduce some of the theory and mathematics of combinatorial methods, readers can use the methods without in-depth knowledge of the underlying mathematics. Accessible to undergraduate students and researchers in computer science and engineering, this book illustrates the practical application of combinatorial methods in software testing. Giving pointers to freely available tools and offering resources on a supplementary website, the book encourages readers to apply these methods in their own testing projects. "I was prepared at the outset to dislike this book. I expected a different subject. It was written by researchers who may or may not have been able to relate to practitioners. It was about a subject that seemed virtually impossible to make practical. But in the end, it turned out to be on a quite different subject, and the authors overcame all my concerns. I thoroughly recommend it to anyone involved in the practice of software testing." A Summary and Review appear at the end of each chapter.